Hello. It’s King Kong by Starship. How are you doing in this cold winter? 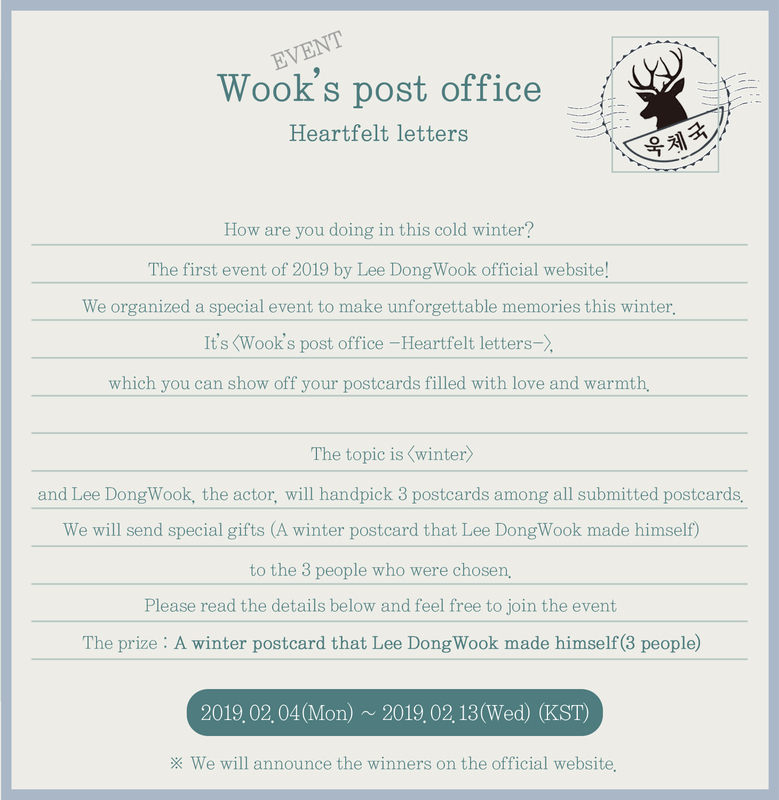 The first event of 2019 by Lee DongWook official website! We organized a special event to make unforgettable memories this winter. It’s , which you can show off your postcards filled with love and warmth. The topic is and Lee DongWook, the actor, will handpick 3 postcards among all submitted postcards. We will send special gifts (A winter postcard that Lee DongWook made himself) to the 3 people who were chosen. Hand paintings, pictures you took, or photos edited by computer software. With love, every postcard is perfect! - The winner announcement : We will announce the winners on the official website. - When joining this event, please make sure you work on 10cm*15cm size postcards. - Multiple postings and entries are possible on this event. - The postings on your social networks MUST be publicly viewable. - All of the postings and applications received after the deadline will not be considered, so make sure you join the event by the deadline. - The postcards of the winners will be uploaded on the official website. If you accept this, click the button on the form. - We will contact the winners by email, so be sure to type the correct information. - The personal information will be deleted after the event. If you have any questions about the event, feel free to send emails to leedongwook.home@gmail.com. ※The official website of Lee Dong-wook will prohibit unauthorized theft, refurbishment and redistribution of contents.